Bed Head Oh Bee Hive Dry Shampoo is a really great dry shampoo for all hair colors. This product has a super fine texture and matte powder which absorbs all of the oils perfectly without making your hair look dry or cakey. I found Bed Head Oh Bee Hive Dry Shampoo to be easy to use, all I had to do was brush out any excess product and my hair instantly looked better and there was no trace of dry shampoo or product pigment in my hair. It also added a good amount of volume and texture to my hair, without being too much volume or texture which tends to dry the hair out. I also really love the smell of the dry shampoo; it smells like a just sprayed floral perfume and it lasts all day. The best part about this dry shampoo was that it lasted in my hair all day long without any touch ups. 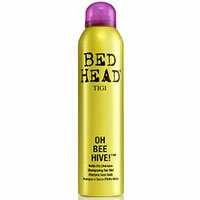 Overall, Bed Head Oh Bee Hive Dry Shampoo works very well to combat oil and lasts all day long. Bed Head Oh Bee Hive Dry Shampoo immediately felt like one the lightest weight dry shampoo I’ve tried. The look of the dry shampoo was matte with a tiny bit of a powdery cast. There wasn’t any major color pigment to the powder. My first impression was that this dry shampoo might be a great one for all hair colors because of the colorless powder. Bed Head Oh Bee Hive Dry Shampoo is very easy to apply. The aerosol application makes for seamless use. Once the product was applied to my hair, it was so easy to blend in. I brushed the excess product through my hair and immediately my oil was absorbed and there was no trace of the product in my hair. I applied this dry shampoo a few times to make sure I had enough in my hair since the powder is such a fine consistency. Bed Head Oh Bee Hive Dry Shampoo sprays completely dry and powdery. The smell of Bed Head Oh Bee Hive Dry Shampoo is really good. It smells like a floral perfume; the smell is definitely strong. The smell lasts in your hair all day long. The results I achieved from Bed Head Oh Bee Hive Dry Shampoo were great! 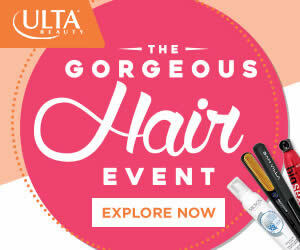 The product absorbed all of my oil very well and left my hair looking more lively and healthy. It also gave my hair a lot of added volume and just the right amount of texture. Bed Head Oh Bee Hive Dry Shampoo lasts all day long. I applied this product very early in the morning and thought I may have to touch up around dinner time but to my surprise I didn’t have to touch up at all. I really enjoyed how long all of the results lasted in my hair. Bed Head Oh Bee Hive Dry Shampoo is $19.99 for 5 oz. That comes out to about $3.99 per oz. That is a fair price for such a great product. Unfortunately, I couldn’t find a money back guarantee for Bed Head Oh Bee Hive Dry Shampoo. To buy Bed Head Oh Bee Hive Dry Shampoo, Click Here.